The more I look, the more I run into when it comes to 1969 festivals and here is another one, albeit, a small one even by small standards. 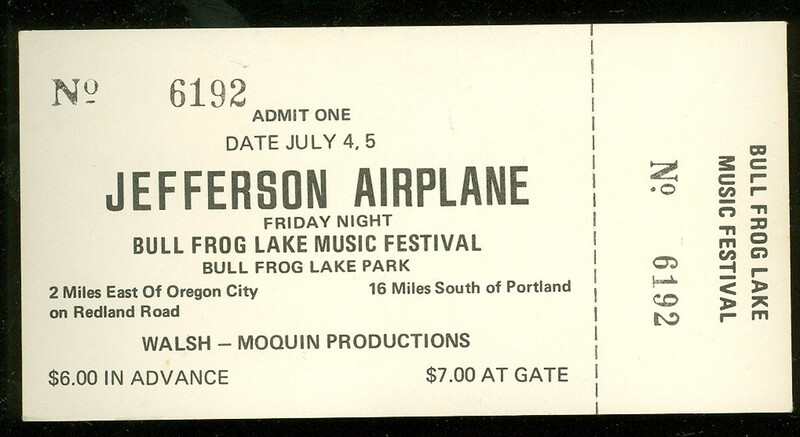 This festivals site was on private land at Bullfrog Lake Trailer Park about 20 miles south of Portland. 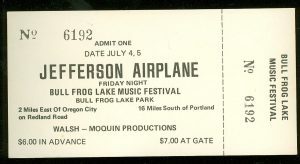 Jefferson Airplane was the main band. They play on July 6. The Ace of Cups were one of the first all-female rock bands. The members were Mary Gannon (bass), Marla Hunt (organ, piano), Denise Kaufman (guitar, harmonica), Mary Ellen Simpson (lead guitar), and Diane Vitalich (drums). All but Vitalich sang lead and all five sang backup. Songwriting, too, was shared. Family Tree may have been a Caribbean band and if so this may be an example of them. It’s nice stuff…similar to Santana. Plus the Portland Electric Zoo Band, Mixed Blood, and other local bands. It wasn’t recorded nor filmed professionally, but below is a silent super-8 film from the event. 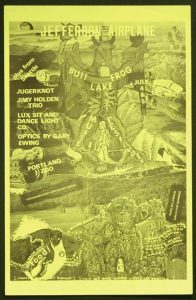 While not big by festival standards, it was apparently successful enough to inspire organizers to hold a second Bull Frog festival that same summer. It ran into a few issues and locals cancelled it, but from its ashes that same weekend Bull Frog 3 rose. Bullfrog I happened in Oregon City, NOT Estacada! Vortex happened at a Forest Park near Estacada, but Bull Frog Lake is NOWHERE NEAR Estacada! Fixed. Thanks, but you don’t have to SHOUT!! !